We are so pleased to welcome this summer’s Interns to the Museum! This cohort hit the ground running – their first day was Monday and amid the regular orientation activities they got right to work, helping prepare invitations to our upcoming members-only preview for Just Married! Wedding Stories from Jewish Maryland. (Have you reserved your seats yet? Don’t delay, space is going fast!) You’ll be hearing from them every Thursday throughout the summer as they explore the world of Museums and the Jewish Museum of Maryland in particular. Below they have introduced themselves in their own words. 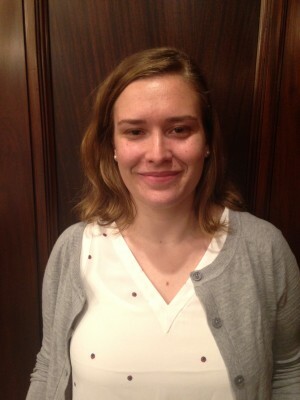 My name is Jillie Drutz and I am very excited to be working as an intern with the exhibitions department at JMM. Born and raised in Reisterstown, MD, I graduated from the George Washington University in 2013 with a Bachelor’s of Science in Biological Anthropology knowing that I wanted to work in a museum. Then, I came back home and I did! I worked in museums! I was so lucky to be able to have worked at the National Aquarium and the Smithsonian National Museum of Natural History doing a variety of work. 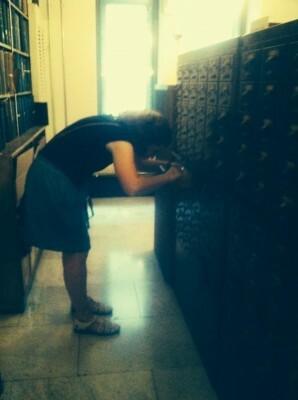 Checking out an old school card catalog. I believe in museums and their extraordinary ability to connect people. I am passionate about research and making it accessible to everyone. And museums are really amazing places to do that. I have gained a lot of museum education and educational management experience, but I really wanted to be a part of research and exhibition development, which was why I was interested in an exhibitions internship. But, specifically why I wanted to intern with the JMM—well there was a much more personal reason. Jewish history in Maryland has a very special place in my heart. Visiting the Jewish Museum of Maryland, I feel like I am learning about my own family. And now interning here, I have the privilege to help others do the same. 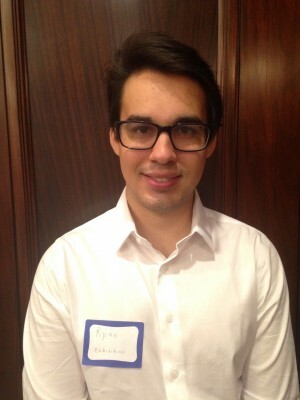 Bonjour/Hi, my name is Ryan Mercado! The greeting in English and French is the “unofficial way” people in the City of Montreal generally greet each other since the city is half English and French, but more on that later. Where to begin? I am 22 years old and I just finished up my undergrad career at UMBC in May! I graduated with a BA in History and Political Science, as well as a Minor in Judaic Studies. My journey to this Museum is different than most. To be more specific, my journey to Judaism is different than most. I grew up in a traditional Catholic family in Olney, Maryland, about an hour south from here. It was a good childhood but when I got older I realized I just didn’t feel spiritual and connected in Catholicism. In my Sophomore Year I took a class called “Ancient Israel” and was first introduced to the discipline of Judaic Studies. Eventually after some soul searching and some delicious challah bread, I decided to convert to Reform Judaism. I am currently in my conversion process and hope to be finished by next year. What fascinates me most about Judaism is its vast history and culture. After that initial class I filled the rest of my undergrad career with Jewish history and culture classes. I knew from then on I wanted my career to focus on Jewish history and culture in some way. I found my way to the UMBC Campus Hillel where I met Ms. Alana Hayes, the Peer Educator here at the Museum, she told me about this internship and I decided to apply and take it! My goal in these 10 weeks is to learn how Museums operate, how exhibits are run, and how history and culture intertwine to create an exhibit. Hopefully, my time as the Exhibition Intern will provide me with that! Currently I am getting ready to move to Montreal, Quebec, Canada, where I will begin my Master’s studies in History at Concordia University. 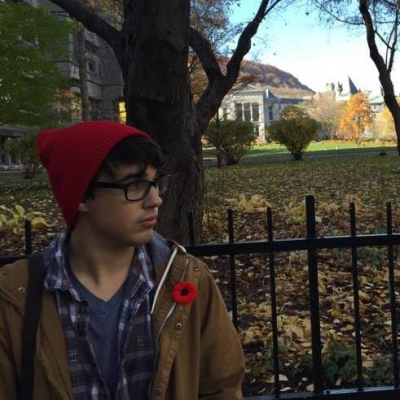 During my undergrad career, I studied abroad in Montreal, learned French, and fell in love with the city. While I was in Montreal, I started my conversion at the synagogue there and delved into the history of Jewish Montreal. I hope that this internship will give me the skills to understand and incorporate Jewish Montreal, as I will do with Jewish Maryland. As for the rest of the summer, well, let’s just say I have a lot of planning and packing to do before my big move! Come by and say hello! I’m sure I can tell you a story about my time in Canada! I was born in Athens, Ohio but I moved to Towson when I was five and have lived there since. I’m currently working toward a double major in Sociology and Fine Art at Scripps College in southern California. 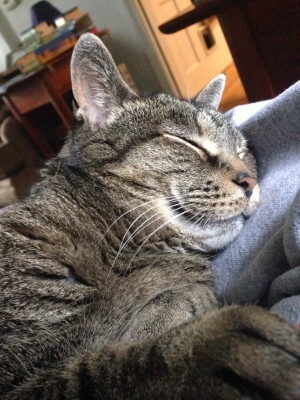 I have recently been terrorizing my mother by baking excessive batches of cookies, and in my other free time I enjoy reading fiction, playing board games with my brother, and talking to our cat. I am one of three Exhibitions interns for this summer. In this role I will be focusing on an oral history collections project for which the JMM is collaborating with Beth Am Congregation. The opportunity to do interview work is a major part of what drew me to this job because these skills are very important for qualitative sociology work. Additionally a lot of art theory has to do with collecting, preserving, and understanding art objects. Working in exhibitions will give me the opportunity to dig into how the JMM does these things with their collections. I’m excited to be with the museum this summer and have this opportunity! Hi! I’m Joelle. I am working as a collections intern this summer. I’m from Los Angeles, but recently graduated from Dickinson College in Carlisle, Pennsylvania. I majored in Art History and Medieval and Early Modern Studies. This summer I am looking forward to learning about the Jewish community in Maryland and exploring the museum’s collections. Museums have always held a special place in my heart and I am really excited to be working at the Jewish Museum. 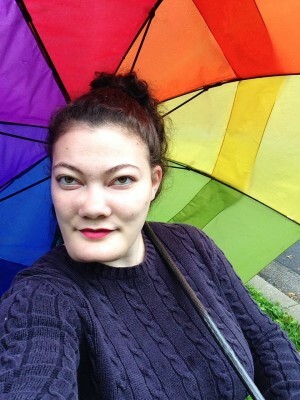 I am hoping to go into museum or non-profit administration and eventually pursue either a law or museum studies degree. The JMM internship appealed to me because it offers incredible experience working with objects and insight into how museums function behind the scenes. 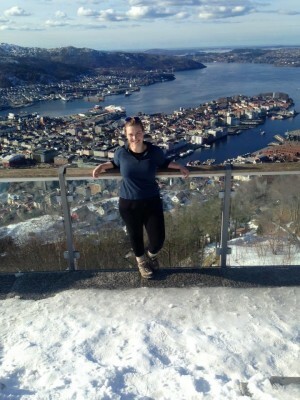 When not at work, I try to spend as much time outside as possible – hiking, camping, etc. I love music, going to concerts, and already miss my college radio station. Ever since returning from studying in Italy, I have been known to spend time tracking down good aranchini. Hi! My name is Erin and I’m from Baltimore, MD. During the school year, you can find me in Lancaster, Pennsylvania with horse and buggy’s. There, I am studying Art History and Religious Studies. When I’m not in class or studying in the library, I love watching the latest romantic comedy on Netflix, keeping up with celebrity gossip, and capitalizing on the student discount at Good Life Ice Cream. I am so excited to be interning this summer at the Jewish Museum of Maryland. Here, I look forward to experiencing the behind the scene aspects of a museum. I am very interested in museum operations and am considering working in a museum as a career. I especially am excited to help plan the events and work with the schools through the education department. 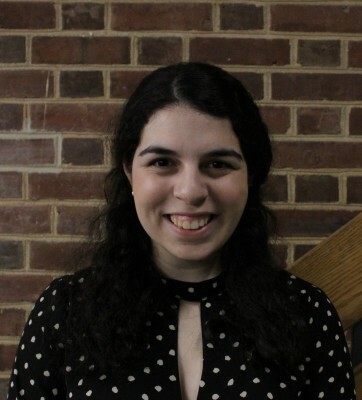 My name is Sara Philippe and I am a summer 2017 Education Intern at the Jewish Museum of Maryland. I’ve lived in the Baltimore area my whole life and graduated from the Park School of Baltimore in 2015. 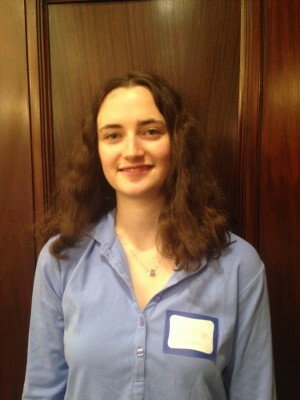 I am a rising junior at Wesleyan University where I’m majoring in History and Romance Languages. I love learning languages and recently began to learning Italian and Arabic. I love to travel, explore new places, and eat good food. I’m really passionate about all different kinds of history and love to read and write about it, as well as teach and share it with others. 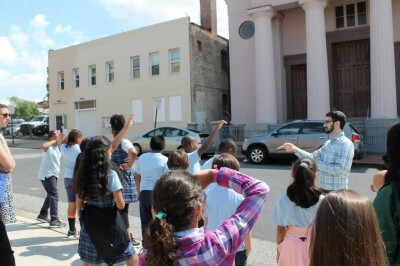 A photo I took today as I observed my first student tour of the museum and synagogues! 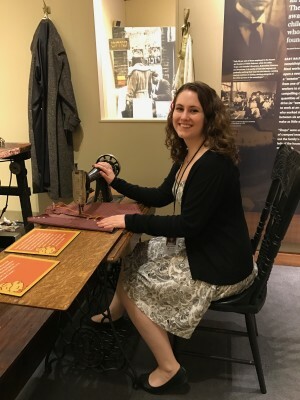 I have always loved teaching and working with students, but I have never worked in a museum before, so I decided working in a museum in any capacity would be an important experience for me because of my interest in pursuing a history-related career. I have always deeply valued the work that museums do in providing the public with access to valuable information and preserving history that could otherwise be forgotten. The history of Baltimore and its Jewish community is also especially interesting to me as someone who is a descendant of Jewish immigrants to Baltimore, so I look forward to the opportunity to engage with this history further. This summer, I am excited about gaining an understanding about some of the work that goes into museums in general, as well as engaging with people outside of the museum through tours and other educational programs. I can’t wait to being of as much service as possible to the museum staff and to getting to know the other interns! 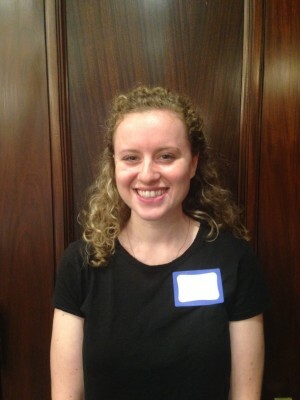 My name is Amy Swartz and I am a Collections intern at the Jewish Museum of Maryland this summer. I am from Reading, Pennsylvania and am going into my senior year at Loyola University Maryland. At Loyola I major in History and double minor in Art History and Political Science. My ultimate goal is to become a museum curator or director. This goal has led me to intern at a few great museums. My first internship was at my city’s archive library, where I became familiar with archiving and filing documents. My second internship was at Baltimore’s very own Evergreen Museum, where I made room guides, documenting all of the artifacts in the museum. This summer I found my way here, at the Jewish Museum of Maryland. I want to learn more about the museum field and I am so excited to begin learning about working with artifacts and collections this summer. Checking out the interactives in “Voices of Lombard Street”! Some fun facts about me: I love to sing and have been doing so since I was a child. I am in Loyola’s all-female a cappella group – the Loyola Belles – so if you are ever in the Baltimore area, you should see our great show each semester! I also love theater and have been in shows since 5th grade so when I’m not spending my money on food (yes I am a foodie) I’m saving up to see Broadway shows. 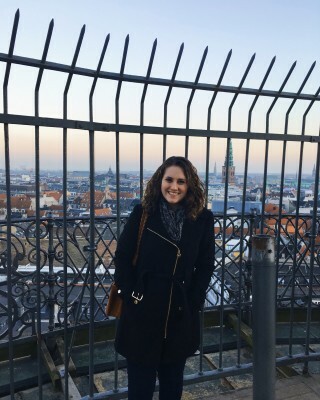 I also just finished a semester abroad in Copenhagen! Stay tuned for more missives from the interns – every Thursday they’ll be sharing their responses to a vareity of prompts. In addition, each intern will share two individual blog posts over the next 10 weeks – follow the tag “interns” to keep up-to-date with all their goings-ons!